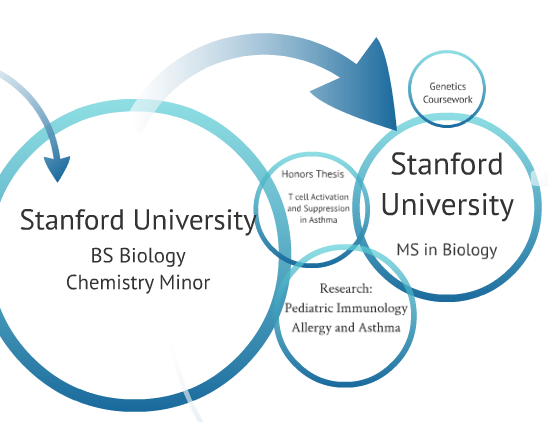 I first became interested in pharmacogenetics as a student at Stanford University, where I received a Bachelor’s of Science in Biology with honors, a Minor in Chemistry, and a Master’s of Science in Biology. I completed my honors thesis with Dr. Kari Nadeau on the role of regulatory T cells in controlling the T cell response in allergic asthma. In this work, I studied cell signaling pathways with florescence-tagged antibodies, chemotaxis in response to lymphokines, and suppression and activation of cell proliferation in cells isolated from patients with allergic asthma. I studied for a quarter at Oxford University, where I took a tutorial on genetics in true Oxford fashion — meeting individually with my instructor for an hour each week. My foundation of experimental genetics was formed at Oxford. At Stanford, my coursework included an intensive multi-quarter lab class “Genes, Genomes, and Proteins: Introduction to Advanced Independent Research Laboratory” in which we explored genetic function using libraries of knock-out e. coli. I participated in the graduate seminars “Epigenetics,” “Theoretical Population Genetics,” “Epidemiology of Infectious Diseases,” “Biochemical Evolution,” “Fundamentals of Molecular Evolution,” and “Modern Plagues.” In addition to a core in Chemistry, Biology, Physics, and Literature, I took courses in Human Genetics and Molecular and Cellular Immunology. Some of my favorite courses included “The Frontiers of Chemical Science,” “The Design of the European City,” and “Human Physiology,” all of which described patterns (either science or history) to explain what we see in the world. These courses, though not directly related to genetics, focused on the same type of relationships that attracted me to genetics. Through a series of special seminars, I studied the genetic structure of populations to learn about human history and evolution using computational genetics tools, such as STRUCTURE, Batwing, and Eigenstrat. These seminars and the courses I took in theoretical population genetics and medical genetics inspired my interest in how genetics affects our health, and how we can use population-level genetic patterns to improve medical care.